Sh. Hemant Gupta, Chartered Accountant and Professor delivered a lecture on ‘Filing of Return’. 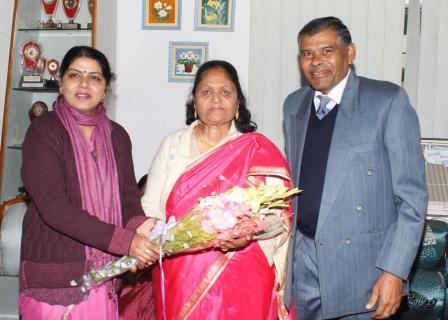 Dr. Seema Arora, Principal DAV College for Women welcomed the guest of the day. Resource person started the lecture by explaining the rules of filing return in simple and lucid manner. Basic terminology of return filing like PAN, TAN, DSC, digital signature, ITR’s was explained to the students. Types of filing of return: physical approach and electronic manner & how e-filing is better over physical method were discussed. The process of e-filing was explained to students with the help of power point presentation. This was enlightening and informative lecture for students and faculty members. In the end the speaker of the day was honored by the Principal Madam and faculty members of Commerce Department. As per the instructions of Directorate of Public Instruction ( colleges) Punjab, a series of events were organized in DAV College for Women, Ferozepur Cantt, under the guidance and supervision of Principal, Dr. Seema Arora, to commemorate 70th year of Independence. On 9th Aug. 2016, NCC and NSS unit organized Tree Plantation in college premises. This event was inaugurated by CHM, Jagdish Singh, in the presence of Principal, Dr. Seema Arora. Guest planted shady trees and gave an informative message to the students about the importance of trees in human life. He emphasized that without trees human lives would not have existed on this beautiful planet. On 10th Aug. 2016, Poster Making competition was conducted by Home Science department on the theme ‘ Aazadi 70’. More than 50 students of different streams participated in this competition. Divya of BA III, Amarjeet of BA I and Nishtha of +2 bagged 1st 2nd and 3rd positions respectively. On 12th Aug. 2016 ‘Run for Fun’ activity was organized in college campus. More than 200 students and the staff members participated with great enthusiasm. On 13th Aug. 2016, Inter class Quiz, Debate, essay writing and poem writing competitions were held on the topic ‘Aazadi 70’. 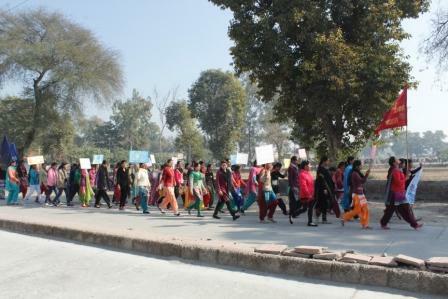 Students from different classes participated with great zeal. On the same day card making and best out of waste competition was organized. In card making 1st, 2nd and 3rd positions were bagged by Divya, Manpreet and Dipika respectively, whereas Rabia was adjudged first, Chandani second and Dipika claimed the third spot. On 17th Aug. 2016, To mark the ‘Azadi 70’ college, students of NCC, NSS, English and PG Deptt. Of Punjabi paid visit to Hussainiwala Border, to pay tribute to the martyrs who sacrificed their lives to get their motherland free from the yoke of foreign rule.A Candle light March was also held on the Samadhi Sthal of Bhagat Singh, Raj Guru, and Sukhdev. Students along with their teachers enthusiastically participated. Honouring the true spirit of brotherhood, ‘Young daughters’ of DAV College for Women celebrated the festival of ‘Raksha Bandhan’ with the BSF Jawans at Hussainiwala border. Girls tie rakhis on the wrists of BSF jawans and also presented handmade cards, especially prepared by them in inter-class competition. The BSF brothers reciprocated the love & affection shown by the girls by showering blessings and refreshment was distributed by them. On 19th Aug. 2016, a skit was presented by the students in order to sensitize the students about the social and equality issues, especially plight of women in this hi-tech society. This skit delivered a beautiful message of universal fraternity. On 20th Aug. 2016, a competition of patriotic songs was organized and students participated with great enthusiasm. Lecture was delivered on the theme of Women Empowerment by Principal, Dr. Seema Arora. She explained that women is delivering multiple roles effortlessly every single day, they are undoubtedly the backbone of any society. Doting daughters, caring mothers, competent colleagues and a wide range of many other roles are played by women around us flawlessly and with grace. She further added that women today are able to empower themselves by organizing campaigns and voicing their opinions for equality rights. As per the instructions of Deputy Commissioner, Ferozepur,(circulation vide letter no. :Election2016/655 dated 09-08-2016), various activities under SVEEP program ( Systematic Voter Education and Electoral Participation) were organised in DAV College for Women, Ferozepur in the month of September 2016, under the guidance of Principal, Dr. Seema Arora. These activities were carried out under the super vision of Prof. Vinay Kumar( Nodal Officer). 3 Campus Ambassadors namely Shabnam (BA Final), Aastha Mittal(BA Final) and Shifa(BA First) were selected. On 26th Aug.2016, Voter Awareness Camp was organised by the Distt. Election Officer in which Mr. Sandeep Singh Garha, SDM , Ferozepur, addressed the students. He generated awareness about the process of voter registration, importance of voting and recognized the performance of the Election functionaries during non-election periods. Sonam of BCA-Ist Semester stood 2nd in Panjab University, Chandigarh Examination. Priya of BCA-Ist Semester stood 3rd in Panjab University, Chandigarh Examination. Mandeep Kaur of BCA-Ist Semester stood 5th in Panjab University, Chandigarh Examination. Surbhi Grover of BA-3rd Semester stood 4th in Panjab University, Chandigarh Examination. Himani of BA-Ist Semester stood 8th in Panjab University, Chandigarh Examination. Simarpreet Kaur of BA-Ist Semester stood 2nd in DAV College for Women , Examination. Parul of BCA-6th Semester stood 1st in District of Panjab University, Chandigarh Examination. Navneet Kaur of BCA- 6th Semester stood 2nd in District of Panjab University, Chandigarh Examination.